As one of the most famous towns in American history, Lexington offers both brains and beauty. With a luscious New England landscape, a plethora of top-tier amenities, and educational opportunities all around, it’s no surprise that more than 31,000 call this Massachusetts town home. First settled centuries ago, Lexington roots back to1642. Originally a part of Cambridge, the area was incorporated into its own town in 1713. With easy access to Vine Brook, the town became a hub of farming and millwork, and it wasn’t until the mid-1800s, when several rail lines moved in, that the area really began to bustle. However, the town’s real time to shine came in 1775, when it served as the site of the first battle in the American revolutionary war. Though that may have been some time ago, the town’s glory days aren’t over. Lexington has seen steady growth for many years, going from just 1,893 residents in 1850 to a whopping 31,394 as of the 2010 U.S. Census. During that period of growth it’s population has not only grown, it has also diversified, with 20 percent of its residents hailing from outside the United States’ borders. It’s no surprise people have flocked to Lexington, though. Aside from the close proximity to Boston, the town is chock full of fun things to do and see. You can get a glimpse of its rich history at Lexington Centre, the Revolutionary Monument, the Centre Depot, Minute Man National Historical Park, the Scottish Rite Masonic Museum and much, much more. History aside, the town is full of modern activities, too. Residents can enjoy the Lexington Symphony, the Lexington Bicentennial Band, the Lexington Players community theater, the Master Singers chorus, ice skating, movie theaters, art galleries and more. The town is also home to a number of bikeways, trails, nature paths and golf courses for the more athletically inclined. Children in the area attend Lexington Public Schools, which includes six elementary schools, two middle schools and two high schools. The primary high school attended is Lexington High, which was ranked the 5th best public high school in the state and No. 194 in the nation by U.S. News and World Report. Students may also apply to attend Minuteman Regional High, which offers vocational and technical training. With all the amenities and educational opportunities, along with its prime location, Lexington is a hotspot on the real estate scene. The average home in the average runs about $715,000, though it is very possible to spend upwards of that amount on a "turn-key" single family home. Generally, for the average price of a home in Lexington, one could expect to get a home that is between 1,200 and 1,800 square feet. And while home prices do dip below the average cost, one would be hard pressed to find a home in the area for less than $475,000. More expansive properties with spacious land and 5, 6 or even 7 bedrooms can easily run in the $2 to $4 million range. 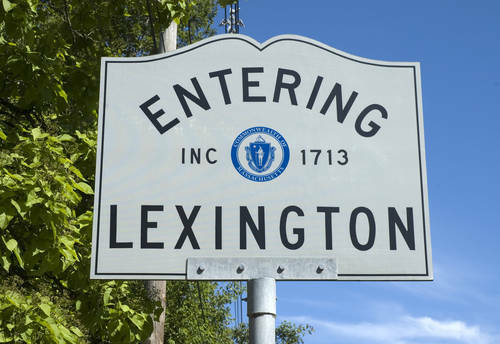 With top-tier schools, an endless supply of things to do, and a short commute in to Boston, Lexington is a fantastic choice to lay down roots and call home.